In my quest to see all 55 Liberty Bell replicas cast in 1950 as part of a U.S. Treasury Department bond drive, I’ve learned there are many more than 55 full-size, functional Liberty Bell replicas in this world — in locations far and wide— from a park in Tokyo to a front yard in Lomita California. Some bells fall into disrepair. Some bells end up mothballed in a warehouse like at the end of Raiders of the Lost Ark. Some bells simply, inexplicably disappear. This is the story of one such bell — lost in plain sight. In Phoenix, Arizona. How does a 2,080 pound Liberty Bell replica disappear in the middle of America’s fifth largest city? We’ll get to that. But first, we’ll start where every bell is born — in the foundry — with someone who loves it very much. Phoenix cattle baron Phil Tovrea Sr. was on a business trip in May of 1950 and happened upon the Paccard Bellfoundry in Annecy-le-Vieux, France. As fate would have it, Paccard was casting the original Liberty Bell replicas commissioned by the U.S. Treasury Department as promotional tools / gifts for a bond drive. Tovrea met fifth-generation foundry president Alfred Paccard and was impressed enough to order his very own Liberty Bell replica. The Liberty Bell is a fittingly accessible American icon. In 1950 or present day, If you’ve get the money and somewhere to put it, you can have your very own Liberty Bell. Mr. Tovrea had plenty of money and the perfect place for his Liberty Bell. Like Paccard, Tovrea knew a few things about carrying on the family business. In 1883, at age 22, his father Edward Ambrose Tovrea arrived in Arizona from his native Illinois (on a freight wagon, as legend has it ). Living out the American dream, the elder Tovrea opened a butcher shop, slung a ton of meat, earned the moniker “Big Daddy” and became one of the biggest cattle barons in the west. Mr. Tovrea had plenty of money and the perfect place for his Liberty Bell. By the 1920s, the youngest of five sons, Philip Edward Tovrea Sr. started to assume the patriarchy from his father and earned his own knick name, “Big Phil.” Under Big Phil’s leadership, the Tovrea empire flourished — running the Tovrea Land and Cattle Company, building an eponymous castle, and in 1947 opening the Stockyards Steakhouse on the grounds of the actual stockyards. Yum. The original location of Tovrea’s Liberty Bell, on the grounds of the Tovrea Land and Cattle Company, in front of the Stockyards restaurant. This unlikely friendship between a larger-than-life American cattle baron and fifth-generation French bell maker led to what may have been the first privately-owned Liberty Bell replica in the world. 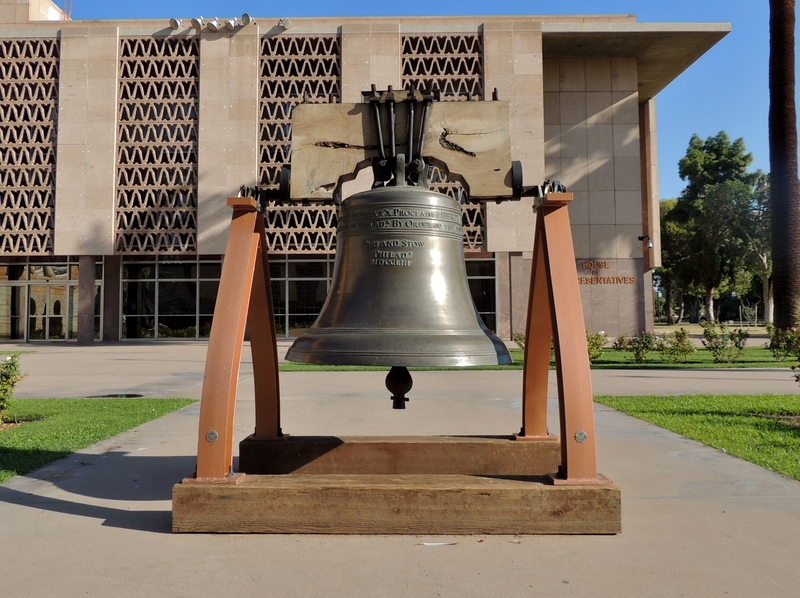 Cast at the same time or shortly after the original 53 bells, (two more bells were added to the run — the United States gifted a bell to France and the French gifted one back in return) Tovrea’s Liberty Bell arrived in Phoenix only months after the state’s official replica, #14, on display in the Arizona State Capitol’s courtyard. Tovrea’s bell has no serial number, but otherwise is identical to the other Liberty Bell replicas. In October 1950, Paccard returned the visit to his American friend, stopping to see Tovrea in Phoenix on his way to Independence, Missouri for the dedication ceremony of Liberty Bell replica #54 — a friendship token and return gift from the city of Annecy France to President Truman’s hometown. Text: A BELL MAKER who really knows his Liberty Bells was in Phoenix Saturday. He’s Alfred Paccard, who’s foundry in Annecy France produced the replica of the Liberty Bell now displayed at the capitol building and those in each of the 47 other states. Alfred Paccard is in Phoenix returning a visit to Phil Toreau, the president of the Toreau Land and Cattle Company, 5509 East Washington street. Toreau was a guest of Paccard in Annecy in May while touring France. While there, Toreau inspected Paccard’s foundry and took a liking to the replicas of the Liberty Bells being made for the 48 states. So he bought one to mount in front of Toreau’s. THE BELL is en route from New York to Phoenix. It will be set up in front of Toreau’s in a week or so. Paccard flew into Phoenix Saturday from San Francisco. He’s on his way to Independence Mo, where he will present the replica of the Liberty Bell to the relatives of President Truman’s before (visiting) Iowa next week. The bell for Independence is a return gift from the city of Annecy, who were presented with a Bell by John W. Snyder, secretary of the treasury, Sept. 4. As fortunes come and go, so too did the Tovrea empire. In the second half of the twentieth century, the businesses were sold off, the castle was purchased by the city of Phoenix and the family was rocked by a mysterious murder. While the Stockyards restaurant carried on under new ownership, the surrounding properties were abandoned and shuttered. Some time between the ’50s and the aughts, the Liberty Bell disappeared. In plain sight. In the middle of Phoenix. In 2004, the former Tovrea property was purchased and painstakingly restored by the Jokake Companies, and the Stockyards restaurant was added to the City of Phoenix Historical Register. It was during the 2004 renovation that the Liberty Bell replica rose from the ashes. Fifty four years after its initial installation, Phil Tovrea’s Liberty Bell was beautifully reinstalled close to its original location — in front of the restored industrial buildings which houses the Jokake Company’s corporate offices along with other tenants. The adjacent Stockyards restaurant is thriving as a reminder of Phoenix’s agricultural heyday. On a personal note, this is the first article I’ve written on a bell I have yet to visit. I’m looking forward to a trip to Phoenix some time when it’s nice and cold in Colorado. It will be the first time I see two bells in one city, and I can’t wait to enjoy some steak and some liberty — just like the cattle barons did. * Not True. The original Liberty Bell was cast by London’s White Chapel Bell Foundry. However, point of fact, Tovrea Castle was built by Alessio Carraro (not Philip Edward Tovrea Sr) in 1928 to be a boutique hotel with home sites surrounding the Castle on his 277 acre parcel. Due to the economic times, (Great Depression) Mr. Carraro sold the Castle to E.A. Tovrea and his wife, Della, in 1931, never having opened his hotel. Mr. Tovrea died shortly after he and Della’s move into the Castle; no murder ever took place on the property – another Tovrea, another location, another time. “Big Phil” was running the Tovrea business at the time of E.A.’s death, but never lived in the Castle. He resided in the Tovrea Mansion just west of the Castle with the company sandwiched in between. His wife, Helen, was instrumental in the original decor of the Stockyards Restaurant and was keen about Liberty Bells, as well. His Liberty Bell is a great feature on the property just south of the Castle and definitely worth a visit! We are proud to be neighbors of The Stockyards with a deep Tovrea History, and commend Jokake Companies for helping keep the history of our area alive and well! Tamera, Thanks for writing and thanks for the clarification. I’ll revise the article accordingly. May I quote you in it?